This fixture would give both sides a great opportunity for silverware this season. 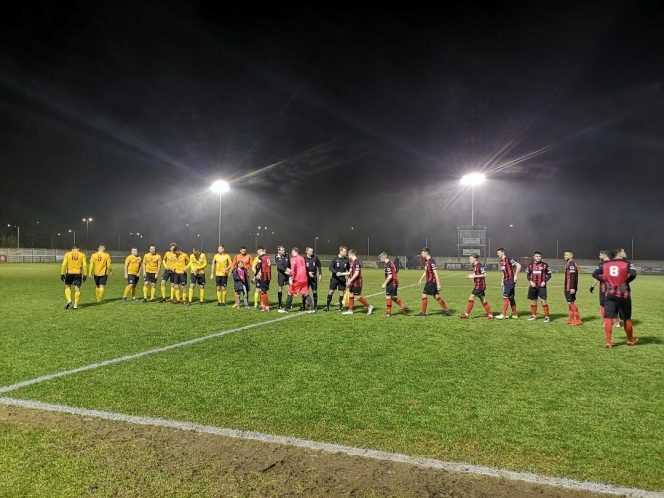 Thame United are eight times winners of the Oxfordshire Senior Cup would host Ardley United FC in this knockout encounter. The game started slowly with Thame attempting to keep the ball all over the pitch and Ardley easing into the game. It didn’t take long until West was adjudged to be fouled in the box and Thame were awarded an early penalty. Ben Sturgess stepped up confidently placed the ball to the GK right side. Thame had a half chance shortly after to double their lead whereby a cross by Peake-Pijnen was headed by West but no one was able to put it into the net. Ardley began to fight back and Hill was forced into a reaction save following some great one touch passing inside the box by Ardley. They showed further threatening attacks often down the right side attempting to hit early crosses into the box. Thame did respond when Lynn made numerous runs down the left and eventually was able to hit a powerful cross into the box which was headed wide by West. In the 26th minute a lapse in concentration led to an easy through ball played behind Gledhill which was shot past Hill by Ardley’s Bryan. Ardley continued their dominance and Essex had to resort to a diving header from a long cross field ball to avoid a one on one with Hill. Ardley took the lead on 32 minutes when a deflected shot from inside the box from Gillett left a fully stretched Hill with no chance to save the shot. Ardley’s tactic of playing the ball behind the defence was evident and they continued playing this way through the first half which saw Smith make multiple runs and dribbles. Thame did respond in the second half and nearly equalised shorter after kick off following a ball over the top by Sturgess which was intercepted by Lawrence before an incoming Tack could get to the ball. Goss was substituted at half time which led to Tack moving to a more attacking position. One excellent creative attack was when Thame’s Martin chipped a pass over the back line and West’s shot hit a defender and went out for a corner. There was a claim for a penalty by Ardley when Smith went down in the box but he was booked for diving by the referee. At this point Thame’s defence was appearing more robust and dealing with balls in the air comfortably and Ardley were being limited to shots from outside the box. Half way through the second half Thame’s Peake-Pijnen produced a drilled cross towards goal which was anticipated and dealt with by Lawrence. A Thame mistake at the back whereby a header towards Hill was short and a gambling Bryan was able to get to the ball before Hill and head it over him to make it 3-1. Thame finally pulled a goal back on 68 mins when the ball was bouncing around the box but a determined West got to the ball 2 yards out to make it 2-3. Thame continued to be awarded corners and free kicks in the last 15 minutes but were unable to find an equaliser. Ardley continued to slow the game down and defend in numbers and happy to attack on the counter and managed to hold out for a huge victory. Ardley will be relishing the semi final cup draw in hope of drawing one of Oxfordshire’s big clubs. Ardley defended with heart and determination in the second half and their forwards were threatening on the counter attack and proved they have quality finishing within the side. Thame on the other hand face a tough trip away to Kempston in the league on Saturday and aim to stop the current run of 3 successive defeats. The Thame United Man of the Match selected by Figaro’s Barber was #11 Matt Peake-Pijnen.